Last chance to stop the toxic Bayer-Monsanto merger! The Department of Justice (DOJ) has conditionally approved a Bayer-Monsanto merger, but we can still block it by fighting back now. This toxic mega-corporation would be the world’s largest seed and pesticide maker with way too much control over our food and farming, and we have 24 hours left to stop it. Send your personal comments to the DOJ now! 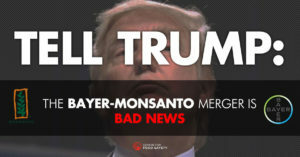 Tell Trump: NO Dangerous Monsanto-Bayer Megamerger! President Trump sat down with Bayer CEO Werner Baumann and Monsanto CEO Hugh Grant at Trump Tower and had a “productive meeting” on “the future of the agriculture industry” and the pending merger between the two companies. 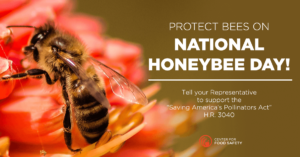 Tell Congress to Support the Saving America’s Pollinators Act! 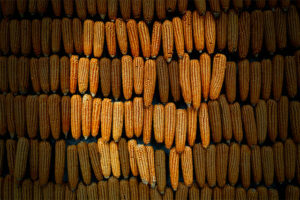 One out every three bites of food we eat comes from a crop pollinated by bees. Yet over the past decade, honey bees and other pollinator populations have severely declined around the world. Americans have called upon the U.S. government to label GE foods for many years, to give Americans the same information provided to the citizens of 64 other countries around the world. Kraft cheese is America’s biggest cheese brand by far. 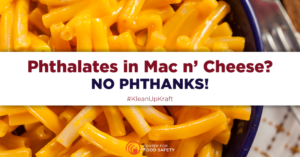 But most people don’t know that some of Kraft’s cheese products may contain toxic chemicals called phthalates.